Motivation is a powerful tool and is central to achieving your goals; whether you want to change your career, promote teamwork in the office, quit a bad habit, or find a new interest, you need to find the motivation to get going and keep going! This no-nonsense guide explains the psychology of motivation and offers practical strategies to help you master your mind and body to unlock your motivation and get more of what you want in all aspects of your life. 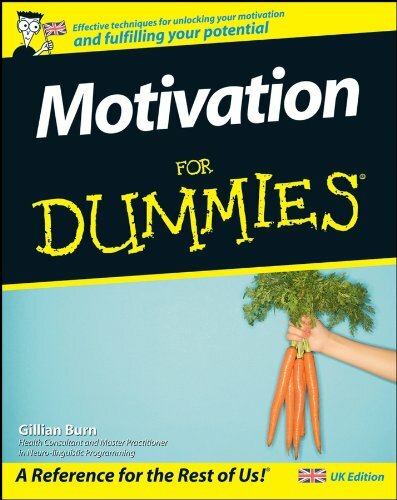 Motivation for Dummies will give you lots of tips and ideas to motivate your life and help you achieve your goals. What it is - a force or feeling, driving you forward and encouraging you to take action. There are many tools to bring motivation into your life, including principles from neuro-linguistic programming. Thinking of motivational role models and tips to get you going! Be prepared to take a risk - failure and bouncing back are key elements for some people in motivation! Failure is a learning tool in itself. Have confidence in yourself that you can do what you want to do - having confidence and self-belief is key to keeping your motivation going. Enjoy motivating your life!